More precise use of data, combined with technological innovation will drive business into increasingly disparate realms. Fujitsu’s corporate vice president and head of platform strategic planning unit and global software centre, Chiseki Sagawa. Fujitsu is looking to focus its technology output on what it calls ‘human-centric technology”, namely applying datasets with new technologies to produce more tangible outcomes for the population at large. 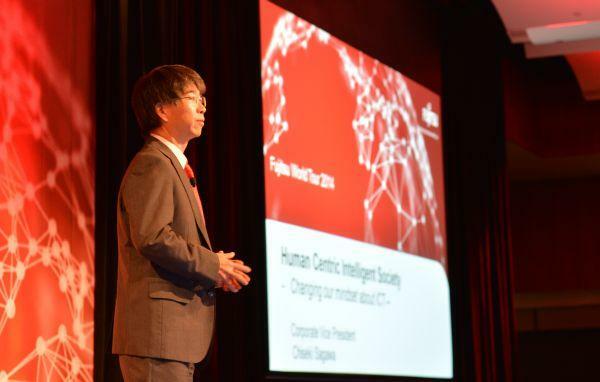 Fujitsu’s corporate vice-president and head of platform strategic planning unit and global software centre, Chiseki Sagawa, claims much of the world’s problems can be resolved through more effective use of data. This data explosion will only continue to rise, especially as the Internet of Things (IoT) takes off. Fujitsu is predicting that the devices connected to the internet will jump from 10bn in 2013, to more than 50bn by 2020. To put that in perspective, a self driving car will produce 3.6TB per hour, a jet engine in the air produces 20TB/h and an human genome is worth 100GB. Opensource has massively opened up the potential for small businesses, and those looking to start a business, to cut costs and provide access to high quality tools. “This is a positive spiral which will only accelerate these trends,” he said. In 2000 its estimated that innovation cost was around $5 million. After opensource took off, that costs dropped to $500,000 in 2005. By 2009, after Cloud’s intervention that cost was just $50,000. Its now around $5000 – meaning anyone can start a digital business. Technologies such as 3D printing have already seen some of Fujitsu’s prototyping times drop drastically, Sagawa telling attendees that in some cases the difference can be a drop from three months under old methods to just 30 minutes. Companies such as Toyota are already implementing sensors in their steering wheels that can detect your bio-rhythms and eye sensors that can detect how well you keep an eye on the road. Toyota’s insurance company is then prepared to use this information to determine your excess. “Access to this level of information fundamentally changes our ways of using ICT, as well as the entire business,” Sagawa said. The ability to blend business objectives with ICT has become more vital than ever. These kinds of technology applications have seen some radical changes to some of the world’s largest companies, who have pivoted into other areas. Panasonic, for example, is now more about in-vehicle and in-house electronics, and are no longer primarily concerned with end-user consumer technology. Amazon has moved from being a retailer, to the world’s largest e-commerce platform via Amazon Web Services. He wants to see the traditional models, which are based around efficiencies, morph into more creative outlets. We are already seeing the early stages of this with next gen, or intelligent, firewalls. Sagawa says another area is ‘smart video’ – rather than analysts having to sit down and tag a baseball game manually, for example, the computer will be able to spot pitches and hits and log the information accordingly. Fujitsu has already used some of these kinds of technologies in real world applications. Metawater in Japan was one of the first to use Fujitsu’s public Cloud. Combined with RFID and augmented reality, a shortage of experts meant that lower level workers could carry tablets, which old and less physically able staff could provide advice from. Boeing and Airbus use Fujitsu’s RFIDs to monitor air pressure, temperature and other real time engine info to develop a profile of part numbers, maintenance history and overall reliability. It also allows for more effective allocation of staffing and resources. Sagawa wants to see all of these technologies used day to day by normal businesses, and the channel partners that supply them. "We want to blend our ICT knowledge, with your business knowledge," he said. "We want assist you in building a creative eco-system via our technical and consultative advice."